On May 12, 1944 three transports steamed out of New York Harbor to join a large convoy headed for Liverpool, England. The SS Edmund B. Alexanderson, The SS Thomas H. Berry, and The SS General A.E. Anderson carried the entire 35th Infantry Division and their equipment – more than 16,000 of us after three and a half years of training. We were finally in the War. We had left Durham, North Carolina by train two weeks before for the overseas staging area at Camp Kilmer, New Jersey, having completed fifteen weeks of retraining and re-equipping at Camp Butner. Within four weeks after our barracks were vacated, Camp Butner was taken over by the 89th Division fresh from maneuvers in California and being converted from a light division to a triangular infantry division. They were to commence the same overseas processing that we had just completed. A number of the 89th Division officers were soon to be pulled out of that division and sent as replacements to Normandy following the much heavier than expected casualties in the infantry on and after D-Day, and several of these came to the 35th Division. The 89th Division arrived later in France in January, 1945, and was assigned as part of Gen. George Patton’s Third Army. 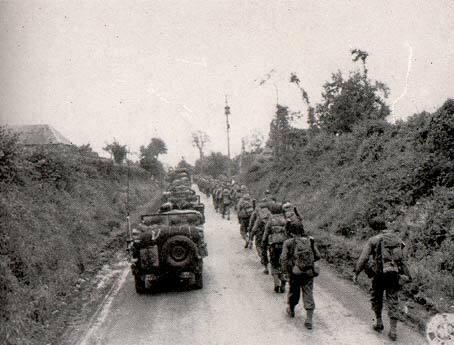 The 35th Infantry Division moves up in Normandy. After an uneventful voyage we arrived in Liverpool and were led ashore by Gen. Paul W. Baade, a fine officer from West Point, who had commanded the 35th Division through its training cycles and would continue to lead us during our entire combat experience. Off the ships came our Santa Fe men lugging their loaded duffel bags and on to the British rail cars who carried us to the Exeter area in Southwestern England, about 150 miles West of London. For lack of a single large barracks area, the division was billeted by units in numerous quaint little villages. It was a beautiful time of the year and the next five weeks of conditioning, training and inspections, interspersed with a little sight-seeing went all too quickly. A high point was on June 6th when the D-Day radio reports and rumors raised tension and concern for the invasion of France which was taking place a little more than a hundred miles South of us. There was a universal relief that the first waves on the beachhead in Normandy were men from the 1st and 29th Infantry Divisions, not the 35th! The rough experience of the first troops also began to forewarn us that the Germans were going to be a lot rougher than we had hoped. There would be plenty of fighting for everybody. A second high point was the inspection visit to the division by Gen. Dwight Eisenhower, Allied Supreme Commander, and his son, John, a Lieutenant recently graduated from West Point, accompanied by the famous Gen. George Patton, newly appointed Commander of the Third Army to which the 35th Division had been assigned as part of the XV Corps. The visitation was on June 25th to the 320th infantry headquarters, to division artillery and special units. Eisenhower’s quiet confidence, his ready smile and easy going personal approach was reassuring, and the troops were particularly amused at the casual way in which Ike turned to Gen. Patton and said, “Georgie, where’s the John? Go and find him for me.” (We thank Gov. Orval Faubus for this quote from his fascinating journal of the 320th’s experience, In This Faraway Land).